Press TV has conducted an interview with Kevin Barrett, editor of Veterans Today from Madison, about Israeli onslaught on Palestinians in the besieged Gaza Strip. Press TV: UN-run schools have been hit five times. Each time Israel has come out of giving their version of what is called an excuse to common being rocket fire came from the vicinity of the school. Is there any doubt that Israel targeted these schools? Barrett: No there is no doubt at all. It has been a very clear pattern in these Israeli attacks not just the bombings … white phosphorous droppings, shelling and so on in Gaza, but also in sniper murders of innocent children, over 600 of which were documented by British Medical Journal in 2004 that the Israelis do intentionally target civilians and they intentionally target children. The preposterous excuse that this is somehow collateral damage because Palestinian fighters were hiding in these schools number one it is simply not true. All the sources on the ground tell us it is not true. Number two, the fact is that Israelis are upset that the Palestinian resistance fighters are in Gaza in an overcrowded concentration camp with two million people in a tiny area, and they blame the resistance fighters for fighting in a crowded area. They are the ones who have penned up the Palestinian people in this concentration camp. There is no place in Gaza where you could possibly fight from where there would not be people crowded around you. But in fact it is not the Palestinian resistance. It is the Israelis who use human shields as a matter of policy. They capture Palestinian kids, women, civilians, and use them as human shields as they are invading Gaza. So the Israelis are lying through their teeth about all of this, but fortunately the world is now waking up and becoming aware of the way the Israelis are intentionally genociding the civilian population of Gaza. United Nations seems to know it. Ban Ki-moon is coming right out and pointing out the obvious, that these are intentional war crimes, intentional attacks on civilians; mass murders of innocent men, women and children; For what purpose? I suppose to aggravate and inflame the tensions in the region. The Israelis have decided that they cannot survive unless there is perpetual and ever-escalating war and so they are creating the very resistance that they deplore by massacring the civilians of the people they are victimizing, and they know there will be a reaction. They know that Israelis and even Jews will be hated all over the world for this for a very long time. They know that people in the Middle East will hate the Zionists and attack them, and they welcome this because they want to be perpetually at war. That is the strategy for endlessly expanding and trying to create a greater Israel. 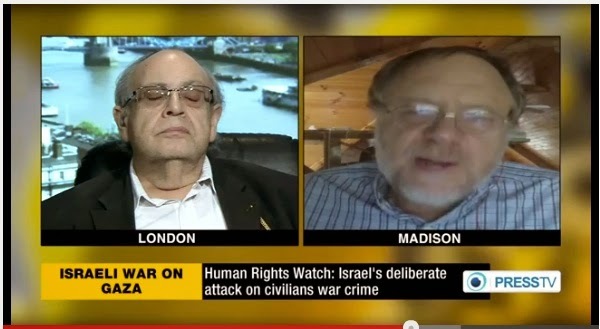 Press TV: Do you think Israel has committed a war crime? Barrett: I think we should prosecute both sets of war crimes - the 99% of blatantly illegal killings and maimings of civilians by the Israelis, and the one percent of people being badly hurt or killed by the Palestinians. I think all of these war crimes should be taken to The Hague, should be hashed out in international court, there should be prosecutions. But in my opinion the Hamas people who are firing these rockets will have a successful defense. Their defense is that under international law occupied people have the right to resist occupation militarily, and the question of whether a given military act is legitimate or not turns on proportionality and what forms of resistance are possible since the Palestinians have the right - and many would say the duty - to militarily resist the genocide that is being inflicted on them. It is not just an occupation. It is a genocide. And the question becomes what form of military resistance, which means killing people - that is what military action is - is legitimate and what is not. The Palestinians are merely firing these little 4th of July bottle rockets. They do not even have any warheads. They are killing very very few Israelis. Now if they were for instance putting nuclear warheads on their rockets and they obliterated Tel Aviv completely and killed all of the war criminal settlers who live in Tal Aviv, that would be disproportionate and I think they should be convicted of a war crime if they did that. But instead they are simply firing these virtually harmless rockets with no warheads. If anything I think that they are guilty of being far far too weak, peaceful, conciliatory - call it what you want - if I were Palestinian, I would believe that I had the right under the international law to put warheads on those rockets and to kill the same number of people that they were killing - in fact more, because it is the Israelis who are the aggressors. They invaded and occupied Palestine. They launched the genocide of the Palestinian people. The Palestinians have the right and the duty to resist. They have the right to kill more Israelis than the Israelis are killing Palestinians. Far more, the Israelis have the duty to stop fighting and to leave occupied Palestine under international law. That is their duty. Every right-minded person in the whole world calls for the destruction of the genocidal Zionist entity in the same way that they called for the destruction of the apartheid state of South Africa. Everyone of decent conscience needs to admit that the state of Israel-Palestine, at the very least, needs to have an equal protection clause in which everyone gets exactly the same legal status regardless of religion or ethnicity, and all of the Palestinian refugees and their descendents have the right to return home, have their lands be returned to them and be given compensation as UN resolution 192 says. …the entire Palestinian population is resisting occupation and resisting genocide. It is not just people in uniform who are called Hamas fighters. The entire population is fighting against genocide. …Hamas is simply the leading edge of the Palestinian resistance which enjoys the support of the vast majority of the Palestinian people. The children want to participate in the resistance. In most cases all they can do is throw stones at tanks and then be murdered by the snipers. But if indeed children died digging those tunnels (in Gaza), I would argue that they died as martyrs doing a very heroic thing just as the similar Jewish children in the Warsaw Ghetto would have done in that situation. If they did not, that was wrong. They should have resisted. The Jews who did not resist the Nazi genocide – and yes it was a genocide regardless of whether the numbers and the gas chambers or what we are told there – but yes there was a genocide. There was horrible racism. There was atrocious persecution of Jews in Germany and the Jews resisted and the ones who resisted are the heroes. The ones who did not resist are not the heroes. Press TV: Are the Gaza tunnels still the goal of this Israeli operation? Barrett: No this is not about tunnels. Tunnels is the talking point that the Zionist propagandists in Tel Aviv issue to all of their stooges and the Zionist power configuration here in the West, where the Zionist lobby has ceased power. I do not know precisely how many and what parts of which tunnels Israelis have damaged or destroyed and which they have not. But that is not the purpose of this operation and they have practically admitted that it is not. Direct calls for genocide are being published in Israeli newspapers. Members of the Israeli parliament are saying that we must murder the mothers who give birth to the little snakes - namely the Palestinian children. Snipers are boasting on social media about massacring Palestinian children and Israel supports this essentially. They will not prosecute any of it because the people there support it. So this is really about genocide. It is about making life so miserable for the nearly two million Palestinians locked up in that concentration camp called Gaza that they will have to leave; either that or they will be massacred, just like they did in Deir Yassin in 1948. This is part of a genocide. It is a Nazi-style genocide against the whole people and it needs to end.